This amazing one-day deal popped up over night, and now ranks as one of the best Cyber Monday camera deals we have seen so far. The Fujifilm X-A3 comes in the retro-looking camel brown finish, and is supplied with a Fujinon XC 15-45 mm f/3.5-5.6 OIS II kit lens. The deal is found at Amazon UKand lasts to midnight today GMT – or until stocks run out (which they often do with these Amazon deals). 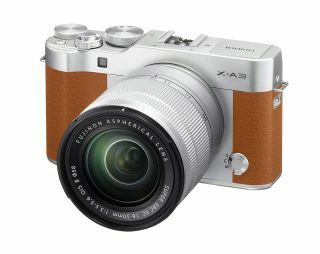 This is not the latest model in the Fujifilm X-Series range of interchangable lens mirrorless cameras – the X-A3 was first released last year, and is now replaced by the X-A5. However, the £229 price tag is a major bargain for a 24 megapixel compact system camera with its flip-up 3-inch screen, 77-point AF system, and buit-in wifi capability. The tilting LCD means that it makes taking selfies and shooting HD video vlogs a cinch. It is currently on sale on the high street for £349 - so this definitely seems a great Cyber Monday camera deal. A great little mirrorless 24 megapixel camera with interchangeable lenses. The X-A3 has built-in wifi and Bluetooth, so can ping your images straight to your smartphone. It has a 3in touchscreen which flips up to make it easier to take selfies or to record vlogs. It is only available in the tan-colored 'camel' finish.